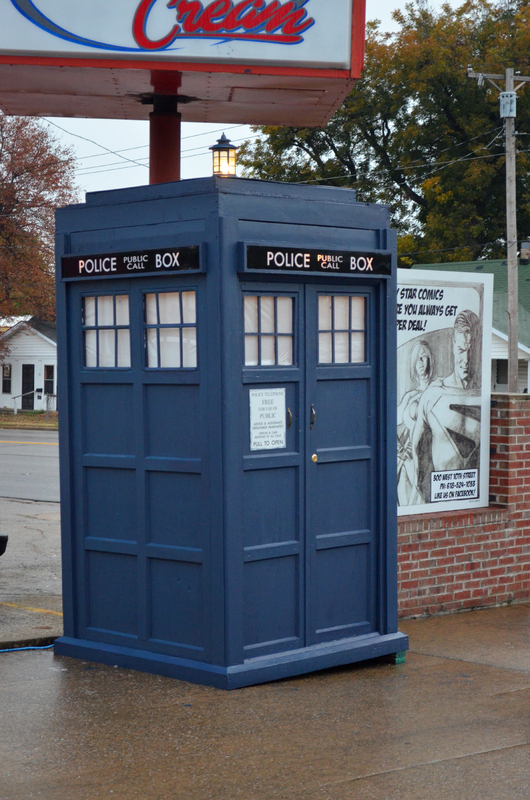 Metropolis, IL- home of the TARDIS..?! This past week or so my wife Nicki and I have been catching up on some Doctor Who episodes on BBC America. Friday night we watched the special An Adventure in Space and Time which featured David Bradley (Filch in Harry Potter) as William Hartnell, the first Doctor. 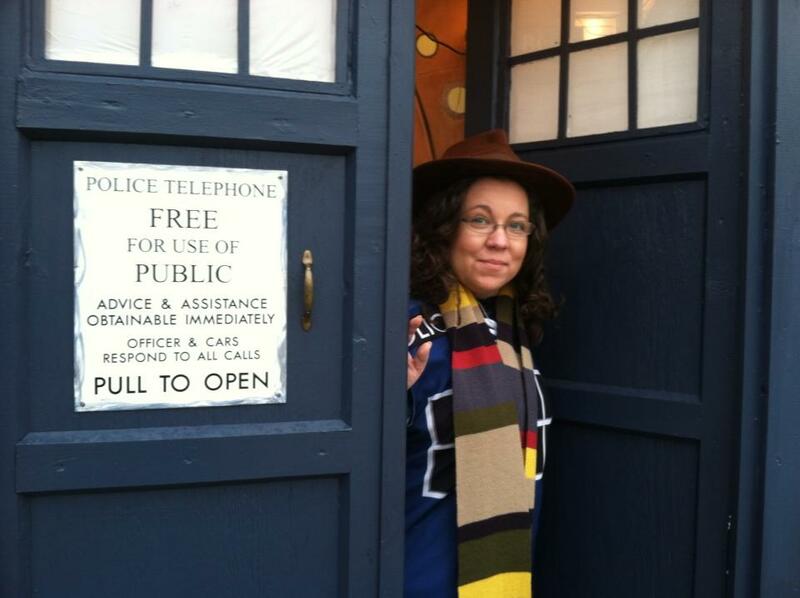 Great story of the birth of the Doctor Who series- and amazingly cast! Kinda scary at just how much they looked like the real life people they were portraying. Nicki and I both wouldn’t mind seeing some of the lost first doctor episodes recreated with them. 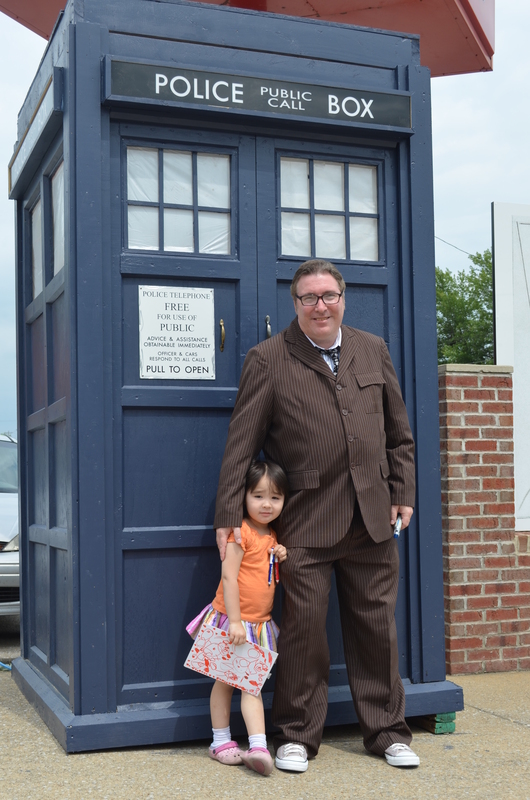 We ended the week on Saturday afternoon by watching the worldwide simulcast of the Doctor Who 50th Anniversary Special The Day of the Doctor. We both really enjoyed it, and ended up watching it a second time when it was shown again that night. Great mix of humor, action, drama, adventure- and 13 Doctors (Spoilers!). Great to have 10 back (or is he now #11..? 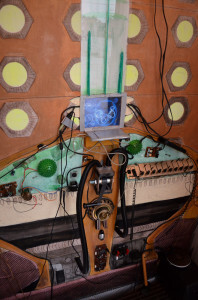 ), really liked John Hurt as the Doctor, and there were lots of Easter eggs, nods, and mentions- many of which Nicki had to point out to me on our second viewing. She’s good at noticing those sorts of things. 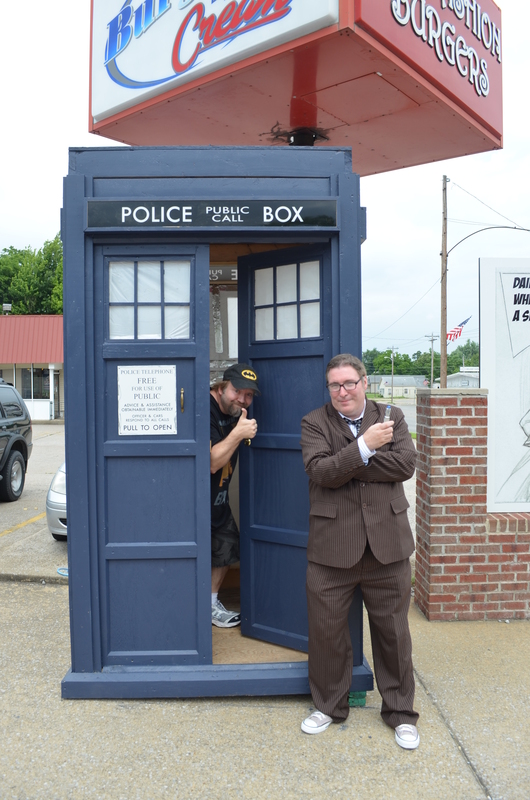 Since it’s been a very Who week, I thought I’d do a post about our trip to Metropolis, IL a couple weeks ago to see a TARDIS in person. Yes, Metropolis- official home of Superman. 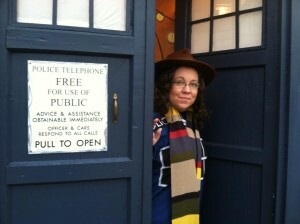 These days it’s also home to a TARDIS. 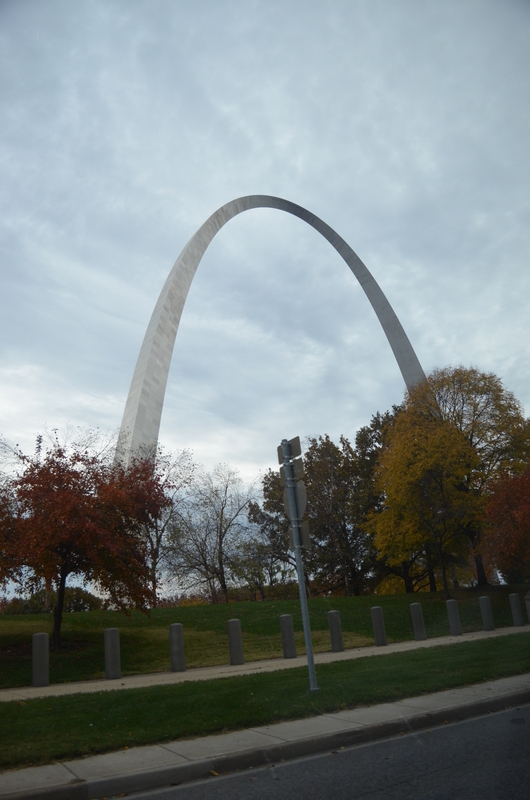 I discovered it on my trip to the annual Metropolis Superman Celebration last June. 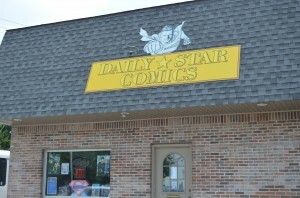 It’s just a few blocks away from the famous giant Superman statue in the center of town, and stands in front of Daily Star Comics. 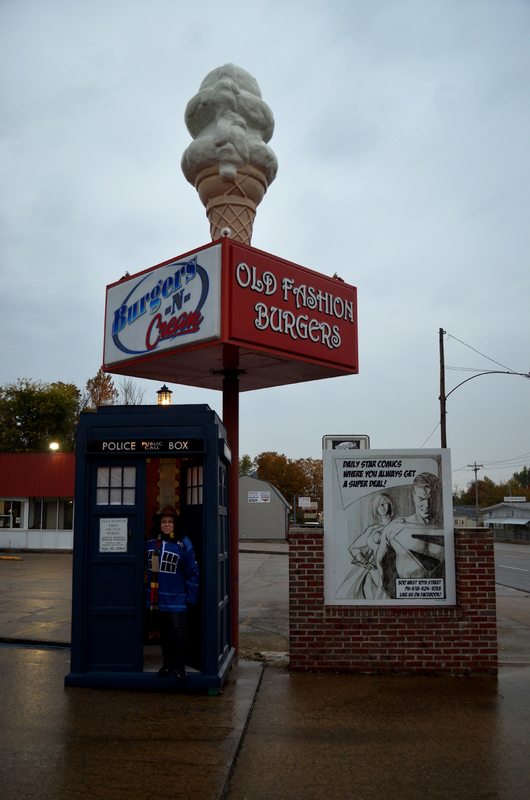 While I was driving into Metropolis on Hwy 45 (which turns into 10th Street once you hit Metropolis) I saw the TARDIS- sitting under a large ice cream cone. I pulled over my Batmobile to check it out. 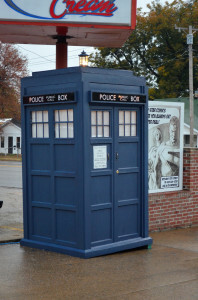 The TARDIS and comic shop are both owned by “Doctor Will” (above). 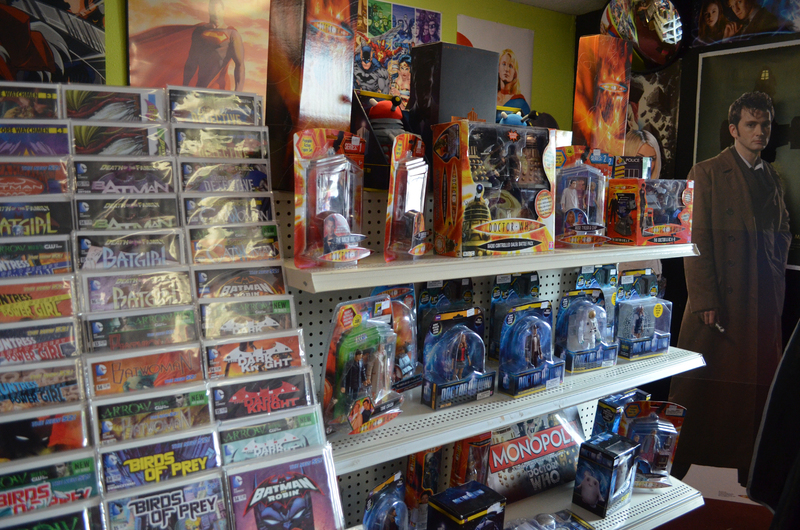 I did a bit of shopping and took home a few Dr. Who goodies for Nicki who didn’t get to make the Metropolis trip that time. 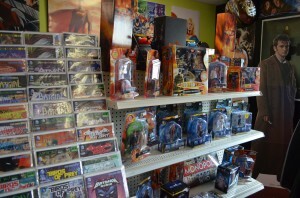 It’s a small shop, but I did find some fun things to make my Dr. Who fangirl happy. 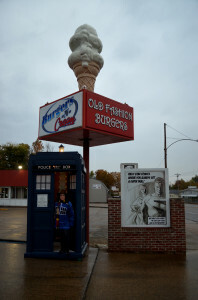 The shop is not located on the busiest side of town, but Dr. Will said his customer traffic has seriously increased since putting the TARDIS out front, especially now that it lights up at night. Earlier this month Nicki took me to St. Louis for my birthday and our anniversary to see the Rams VS Titans (a story for another blog), so on our way home we took a bit of a detour and stopped in Metropolis to visit the TARDIS for a fun photo op and do some shopping. 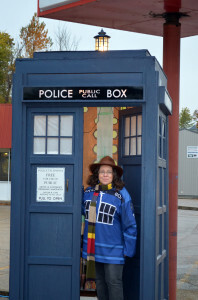 It was a bit rainy, but luckily the Doctor unlocked the TARDIS so Nicki could step inside. 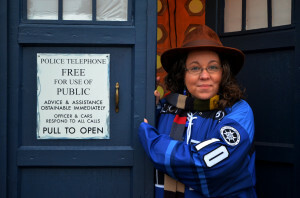 Once inside out of the weather I snapped a few shots of Nicki wearing her Geekey Jerseys’ TARDIS hockey jersey (a 10th Doctor), her 4th Doctor scarf and hat, and TARDIS earings. 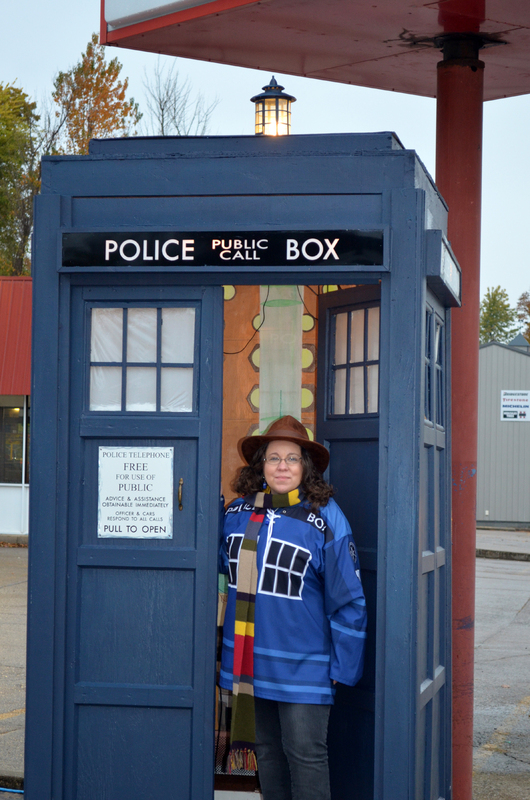 We had a lot of fun with the big blue box- and it even sounded like the TARDIS. So, if you’d like your own TARDIS photo op and/or some Dr. Who collectibles and are near southern Illinois, be sure to take a trip into Metropolis and visit Daily Star Comics. 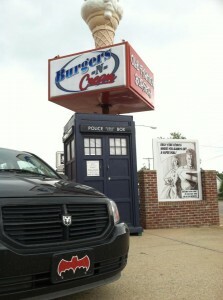 Have Geek Will Travel » What do Superman and Catsup have in common?